Ciutadella Park, a part of the city I had not covered much in my blog in the past, is a vast green area, a sort of Central Park that holds some museums and the zoo and is sprinkled with numerous sculptures. 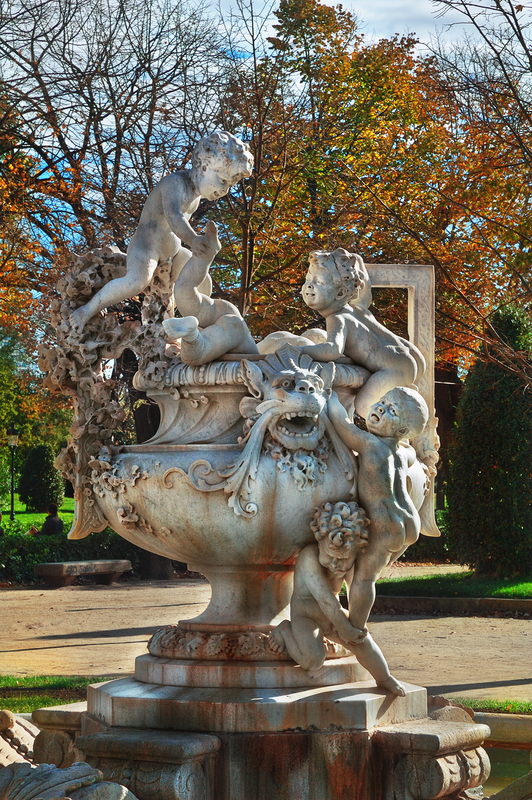 This fountain designed by Josep Reynés dates back to 1882. The Font Gerro amb Nens (water-jug with children fountain) is one of the finest in the park. Josep Reynés (1850-1926) was a Catalan sculptor that was trained in Barcelona and at Carpeaux’s studio in Paris. He was greatly influenced by the French school. We saw one of his works when we featured the reliefs at Arc de Triomf. Beautiful fountain set against those fall leaves! Very nice. Delightful. The children are so very realistic. Fun photo! The expressions carved on the faces of those kids look so realistic! Nicely sculpted fountaind and brilliantly shot photo! Wow fantastic sculpture! I'd forgotten how great your blog is - I'll be back soon. I love this...beautiful. So much detail!